In August, my girlfriend and I stayed at Catoctin Mountain Park located in northern Maryland, close to the city of Thurmont. We had been planning a different camping trip for July, but my girlfriend was working two jobs over the Summer (one of which was a new job) so plans changed up a bit to head to Ocean City in July and then plan a long weekend of camping in August. Since it was somewhat of last-minute trip, it was tough finding a good camping spot as most had already been reserved especially with it being a weekend in the Summer. Little did we know at the time that there was what seemed like a great National Park in Maryland which apparently other people did not realize either as there were plenty of spots to choose from! We ended up staying at the Owens Creek Campground for three nights and had a great time. We stayed at one of the campsites on the creek side of the campground, which was nice to hear it running through right behind our tent! You can check out a map of the campground here, and even check out photos of each campsite you might be interested in reserving so that you know exactly what your campsite will be like. Most of the campsites were pretty private and secluded, though it was possible to see your neighbors across the way depending on where you were situated and what type of camping equipment you have. The bathrooms in the campground were fairly clean and kept well stocked with soap and toilet paper throughout the weekend, and the showers had plenty of hot water so there were no complaints there. The only problem that I can see that when the campground is full, there would definitely be a wait to shower. There is a separate area to wash your dishes which makes things easier. The park rangers that we spoke to both at Owens Creek and at the Visitor Center at the entrance of the park were extremely helpful and polite, so it’s always a bonus to deal with nice people! You can also get firewood for only $5 a bucket on the honor system, which seems to be right in line with most parks so you have to figure in you will be spending that $5 each day. 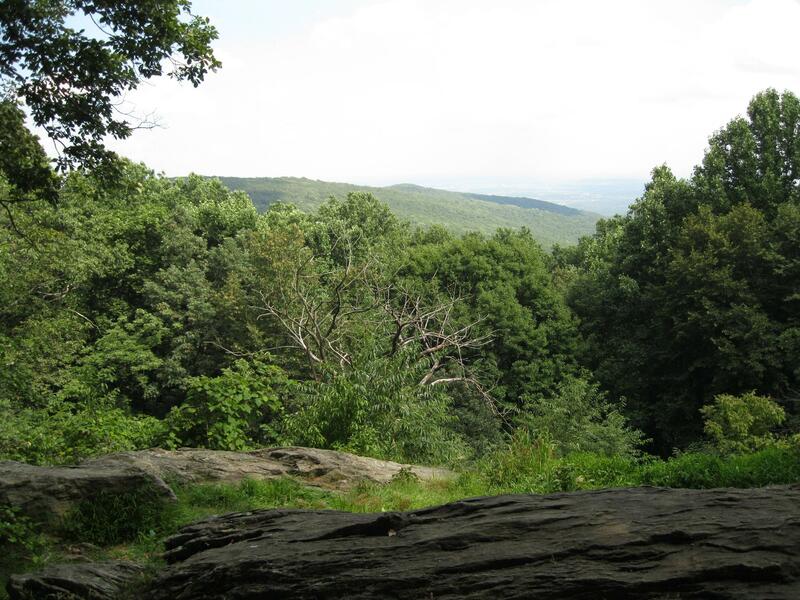 There is plenty of hiking in the park which we took full advantage of during our few days at Catoctin Mountain Park. We took on most of trails on the East side of the park doing a combination of blue ridge summit trail, hog rock vista trail, Thurmont vista trail as well as checking out Wolf Rock and Chimney Rock. You get a ton of great views and these trails are definitely more challenging than the trails on the west side, but nothing too difficult. I really enjoyed Chimney Rock and the Thurmont Vista had the best view in my opinion. 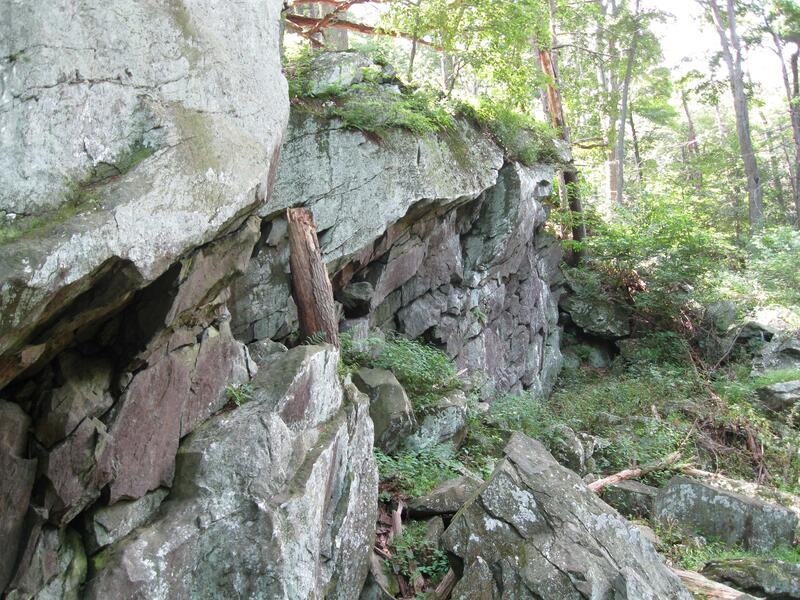 If you have a permit, you can actually rock climb on Wolf Rock too. If you forgot anything or needed more ice or food, there is a Food Lion right in Thurmont that is only about a 5-10 minute drive which is extremely convenient. We also took a trip to Cunningham Falls State Park to check out the beach there and to hike the falls trail in that park, which is just across the street from the National Park. There is also the Catoctin Wildlife Preserve & Zoo nearby if you are looking for something else to do, though we did not get a chance to visit that. Also as you approach the park is the Catoctin Mountain Orchard which has tons of fresh and locally grown fruit and vegetables and there were plenty of other local produce stands nearby. If you are into fishing, there is a ton of great trout fishing in the park and it is actually one of the most popular spots for that in Maryland. If you are looking to visit without using a tent, Catoctin Mountain Park also offers rustic cabin rentals at Camp Misty Mount. The cabins here have indoor and outdoor lightning, but there is no electrical outlets inside the cabin. If you have to charge any devices, you will need to use the bathrooms or a car charger – similar to tent camping. Each cabin has a fire ring and picnic table as well, and there are a bunch of different size cabins depending on how many people you have. Camp Misty Mount also does grant you access to a pool for just that campground too, which would be great during the Summer months. This is a great park if you enjoy hiking and just want to get away for the weekend, or even stay a week in a cabin at Camp Misty Mount. It was surprising to us because we had never heard of this National Park that was so close by, as you usually think Yellowstone, Yosemite, Acadia, etc when you think National Parks. 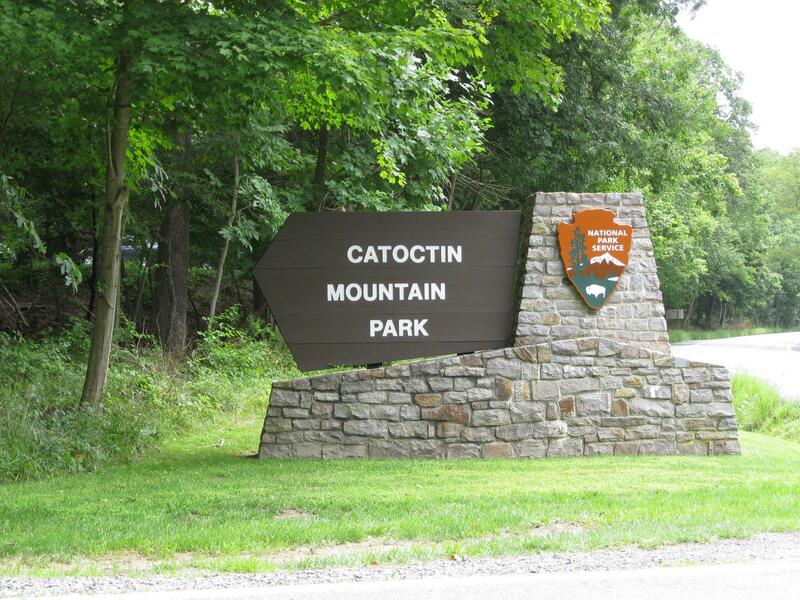 But Catoctin Mountain Park is a great little “hidden gem” with plenty to do bothinside the park and in the nearby area. There aren’t as many reviews online for this park as some of the other state parks we have visited, but they are generally favorable. I’m going to be adding to that with my Catoctin Mountain Park review, and I’m hoping that you found it helpful. I do recommend visiting Catoctin Mountain Park if you get the chance.